Simple Wording: You can minimize the size of your plaque by choosing to simply have words to convey your message. Jot down on a piece of paper what you want the plaque to say. Keep it simple. Type it out, but to allow for the casting of metal, you need to give everything more space than you would for a printed piece. One rule of thumb is to Expand the lettering by 2 to 3 points. Keep the lettering large - start with 36 points and a Times Roman font for upper/lower case or 30 points for all capital lettering. Be generous in all your spacing. Most designs include a border - but the border is inside that area, so your wording has to be inside of that. Wording plus Logo or Line Art: To include a special logo or line art along with your message is beautiful, and we have many examples of how nice it looks. But know this right now - the art must be simplified and lines must be a certain thickness so that the metal can be formed. Do not submit a JPG file and expect it to work. Space must be allowed for any kind of logo or line art. Art requirements for a plaque logo to be rendered, from the foundry: (a) file must be vector format in the file that created it (*.ai, *.eps, *.cdr) in editable and resizable form; (b) black and white so that the black indicates where the metal color (silver or gold) will show through, and white will be the background color; (c) save in a file that CS5 or Illustrator 12 can open; (d) letter size minimums of 3/8" for upper/lower case and 1/4" for all capital letters; (e) no shading or grays; (f) line minimum 3 points; (g) spacing in between items including letters must be at least 1/16"
For a PDF of the art requirements, see this link. When you go to order one of our plaques, you will see some choices to make as to the making of your plaque. You should be aware of how to specify what you want so that you will get what you need. All of our plaques feature raised lettering. If you wish incised lettering, it is a special order. For a PDF of what to specify for your plaque, see this handy link. It's a handy document that's only two pages but shows a lot of what you need to decide, all in one place. As mentioned earlier, any border must fit within the size you are ordering. The most common border is Single Line. 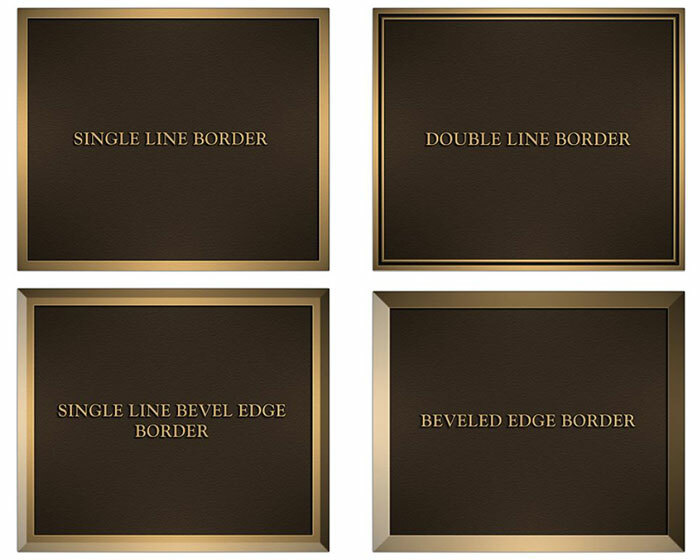 The nicest border may be Single Line Bevel Edge if you have enough room. Other choices are: Double Line, Bevel Edge, and No Border (not shown). Single Line is the default border. Background color is the painted area behind where the lettering goes on a plaque. Most common colors are: Black, Dark Oxide (like dark chocolate color), Brown, Gray, and darker colors such as Forest Green and Midnight Blue are popular. You must choose a texture because this makes the metal look nice and even. Currently we offer Leatherette, Pebble, Stipple, and Sand. Perhaps the most important part of your plaque, the mounting method will help you install the plaque once it's done. The most common method is Blind or Stud Mount, in which the hardware is inserted in from behind, and the plaque is mounted that way. Even when you need to install a plaque into a boulder or concrete, many customers like this method because they can drill a pattern and insert the plaque into it using expansion bolts and/or silicone sealant. Another reason customers like this method is because once it's installed, the plaque is difficult for vandals to extract. Mounting methods include the Blind or Stud Mount, Wood Mount, Concrete or Solid Wall Mount, and Hollow Wall Mount. For all methods except the blind, 4 holes are placed in the corners of the plaque, and you get hardware (including standard rosettes) for placement. 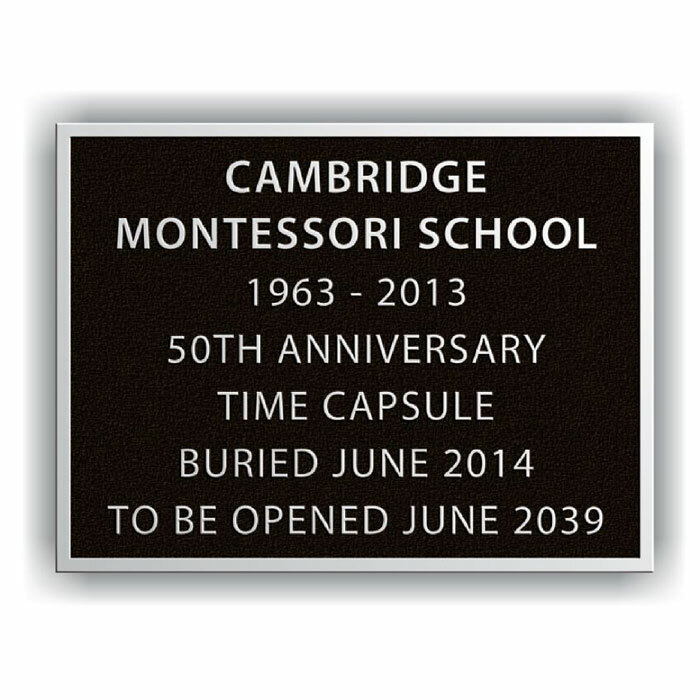 Click here to order our plaques. First, choose the metal you know you want. Then, choose the size category, and then the actual size. From that point you get to type in what you want the plaque to say (this is by far the fastest way to get a proof and the quickest for delivery). You choose the border, texture, background color, and mounting method. You can even upload a file. Once your order gets into our system, we begin working on a proof for you to look at and also a specifications sheet that calls out what you want. You need to approve the proof before we can submit to the foundry. We generally ship the plaque within 3 weeks after your approval of the proof.